Selective Laser Sintering (SLS) is another type of 3D Printing technology. In this process powdered materials are used in conjunction with a high power laser that fuses the powder into physical objects based on a CAD (STL) file. Like all additive manufacturing techniques, each layer is created from the ground up to create the desired geometry at very high resolution. SLS technology out performs other 3D printing technologies in that it has a wider range of material available. There is no separate support materials needed in this process as the part is supported by the layers of powdered material. 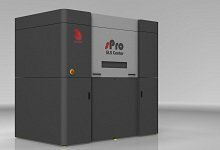 Finnovation Product Development proudly uses the sPro SLS Center for your SLS needs. The 3D Systems sPro is the latest in SLS technology and provides many dynamic material options, including carbon fiber composites. FPD has the sPro SLS Center in-house and allows for the fastest turnaround time in the industry. We offer diverse material options and offer no obligation consultations to help choose the best material for your requirements. Contact Us to see how the latest in SLS Rapid Production can streamline your design process.